Conflict is integral to life, but how a society manages conflicts reveals how mature it is. Total absence of conflicts may also not indicate an ideal society. Despite having produced thought-leaders like Buddha, Mahavira, Ashoka, Tagore, Gandhi, Ambedkar and Vinobha, our civilization doesn’t seem to have progressed beyond the “win/lose” logic when it comes to dealing with conflict. And once the conflict is over, we refuse to publicly introspect and strengthen our humanity. The Conflictorium is a space that strives to engage every section of society with a variety of conflict issues, by celebrating plurality and encouraging conflict expression and avoidance in artistic and creative ways. 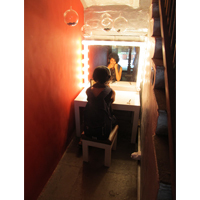 A sound installation by Avni Sethi, “In This House and That World” introduces the layered history of the building and locates the audience-participant within this continuum. The “Conflict Timeline” attempts to showcase the violent and oppressive past of Gujarat, since its inception in the year 1960. 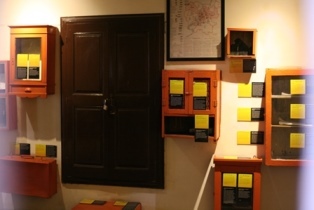 The “Gallery of Disputes”, designed by Mansi Thakkar, aims to bring forth various kinds of conflicts and their causes in the context of our social fabric. Most often interlinked, these conflicts and their causes may become hard to define and understand. As a museum that aims to reach out to a wide audience with varying backgrounds, a decision to convey the content of the gallery through stories was made. ‘Museum culture’ may be western, but ‘story-telling’ is universal. 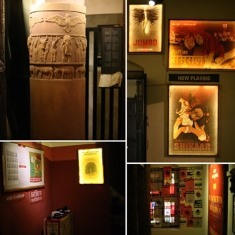 Drawing from structures and motifs in animal fables like the ‘Panchatantra’ by Visnu Sarma and fiction like ‘Animal Farm’ by George Orwell, the gallery follows the story of a Donkey, a beast of burden living in a forest, with a social fabric as complex and conflicted as in the human world. The story unfolds as the visitor walks through the gallery through mediums such as sounds, props, animations, light, shadow, etc. The visitor is treated to a carefully structured narrative whose elements may be followed in order to glean the story. 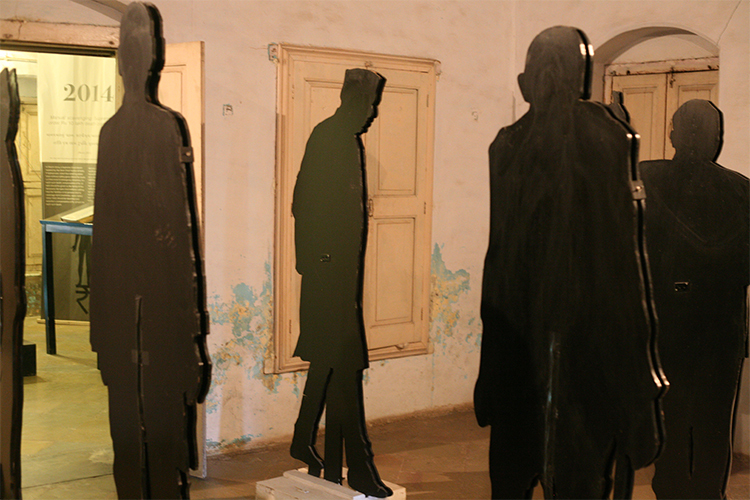 The “Empathy Alley” comprises of silhouettes of political figures such as M.K. Gandhi, Dr. B.R. Ambedkar, Jawaharlal Nehru, Mohammed Ali Jinnah, Sardar Vallabhbhai Patel, and Indulal Yagnik. Each figure has a speech in the original voice and the speeches express the ideological thinking of each leader during the time of post-independent India. In this room we have displayed a copy of the Indian Constitution (a pre-1977 version) and there are no restrictions on visitors as to how they engage with it. We encourage the visitors to go through the world’s longest written Constitution and try to understand its different elements. Knowledge of constitutional rights is essential for every citizen and the inaccessibility of the same is what we’re trying to overcome in this particular space of the museum. 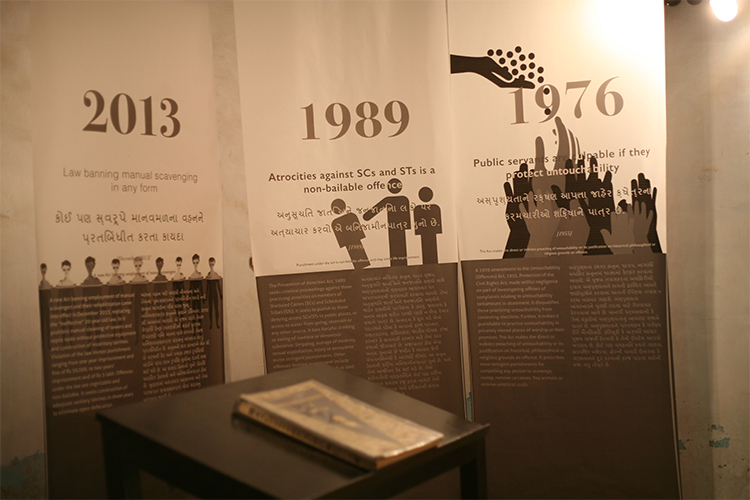 In addition to the Constitution’s presence, the space also has panels that display the human rights movement that spanned several years, for getting the inhuman practice of manual scavenging banned by the law of the land. The “Memory Lab” is a community art installation that provides the visitors an outlet to express their innermost thoughts without any hesitation. 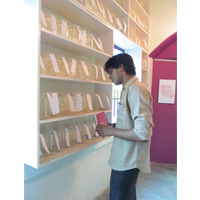 The empty jars on the shelves are there to preserve the memories of conflict in the lives of the visitors. 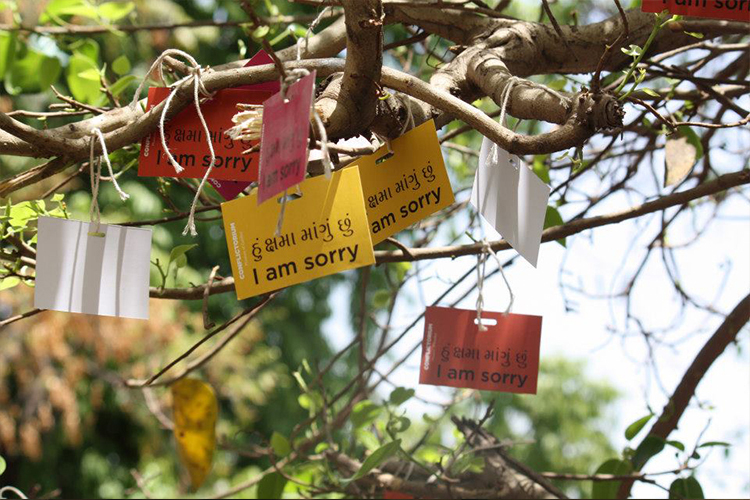 The peepal tree outside the Conflictorium has been made the “Sorry Tree”, where visitors are reinforced the importance of one word of apology and the weight it often carries when left unexpressed.